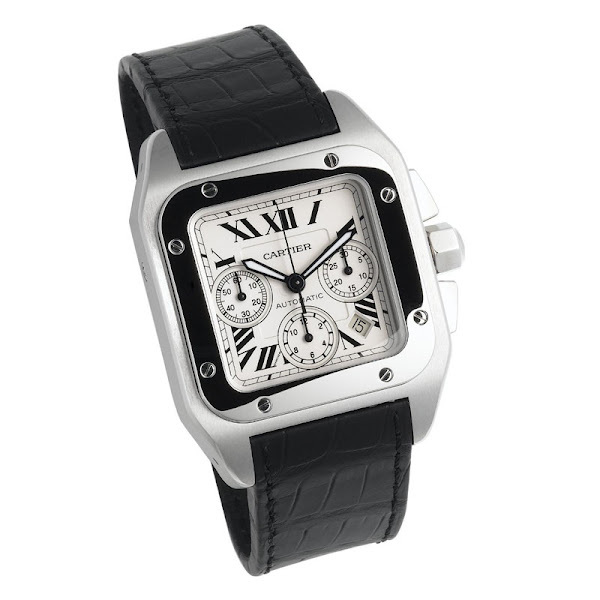 The W20090X8 is Cartier's Santos 100 XL series model with a combination of leather and stainless steel. Its band combines black alligator leather with stainless steel accents to add an athletic edge to your fashionable looks. This Cartier is protected by scratch resistant sapphire crystal with case diameter of 42-millimeter are studded with screws on the square bezel, the genuine black alligator leather band sports Cartier's patented deployment buckle folding clasp. Furthermore, the W20090X8 model wristwatch's dial has a date display window is positioned four and five o'clock, a Roman numerals mark the time on the silvered opaline-white dial where three inset chronographs display seconds, minutes, and hours with stop/start functions at the flick of a button. This timepiece is powered by Cartier's own Calibre 8630 Swiss automatic self-winding movement, this 330 feet (100 M) water resistant Cartier Santos 100 XL's original price is $8,800. You can find an original Cartier W20090X8 Watch at the site(s) listed above. However, we don’t guarantee its availability as being listed here simply means that those site(s) has the item in question by the time we wrote the review.